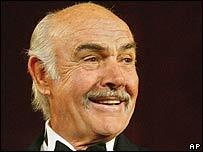 Sir Sean Connery has signed a publishing deal to write a book about his life and views on Scotland. Connery's Scotland is expected to be published in September 2007 to mark the 300th anniversary of the Treaty of Union between Scotland and England. The 75-year-old actor will co-write his first major book along with author and film maker Murray Grigor. It is expected to be a mixture of memoir and Sir Sean's take on Scots history and events. Sir Sean, who went on to become a star after beginning working life as an Edinburgh milkman, has already started the book. He said: "Our goal is to produce a very readable, visually stimulating and hopefully intriguing history of Scotland, with personal discoveries." The book will draw on archive photographs and chapters will explore Scottish humour, literature, art, architecture and sport as well as focus on Sir Sean's native Edinburgh. It will be released by publishers Canongate, an Edinburgh-based firm, and Polygon. Jamie Byng, publisher at Canongate, said: "We are absolutely thrilled to be publishing Connery's Scotland. "Not only is it going to be a fascinating and revelatory book about Scotland, but Sir Sean is a natural storyteller with his own great story to tell."